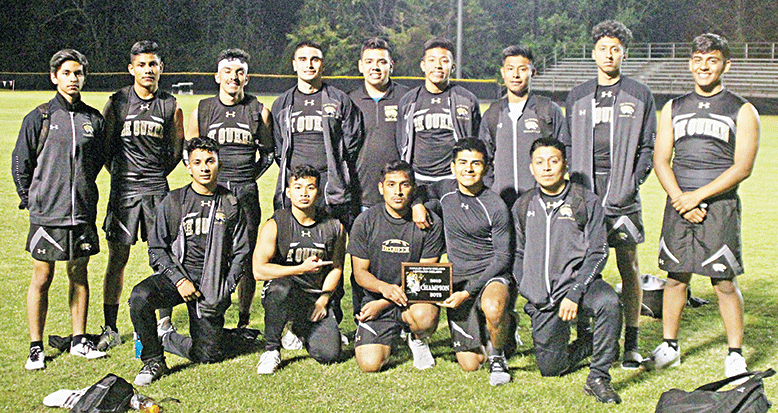 The De Queen senior boys track team won the Collin Raye Relays April 11, the first senior high meet to be held in Leopard Stadium in two years. Ashley Dykes crosses the finish line of the 800 meters at the Collin Raye Relays in a meet and school record of 2:24.77. Devin Burgess gets airborne in the high jump at the Collin Raye Relays. The De Queen sophomore cleared six feet for the first time at the meet. Lady Leopards Pamela Delgado and Xoctil Flores run in the 1600 meters at the Collin Raye Relays. The pair scored points in both the 1600 and the 3200. Leopard Fernando Ferretiz and Song Changg make the first handoff in the the 4X100 meter relay at the Collin Raye Relays. Ashley Dykes set a new Collin Raye Relay mark of 2:24.77 in winning the girls 800 meter run. 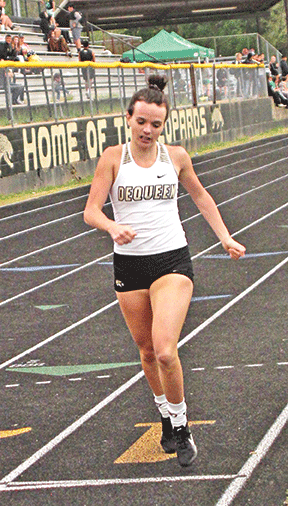 It was the third time this season Dykes has lowered the De Queen High School record. The two lap race for the boys was not a record, but it was fast. Hector Hernandez clocked a season’s best of 1:58.67. De Queen won the boys team title with 138 points. Nashville had 109.5, Prescott 87.5, Genoa Central 71, Idabel 70, Broken Bow 70, Hope 60, Ashdown 47 and De Queen B 5. In addition to winning the 800 Hernandez was first in the 1600 meters in 4:39.58. Malik Beasley won both the shot put, 51-4, and the discus 140-0. Adrian Mendoza was second in the discus with a distance of 123-3. Asael Sanchez placed second in the 3200 meter run in 10:56.54 with Anthony Sanchez third in 10:57.68. In the 1600 Anthony Sanchez finished third in 4:50.90 with Asael Sanchez fourth in 4:56.48, both multi seconds personal bests. Alejandro Lerma was third in the 800 in 2:10.75 and Richard Angeles fourth in 2:16.72. Song Chhang ran 45.30 for fourth in the 300 intermediate hurdles. Kevin Villeda, 54.23, was fifth in the 400 and Miguel Diaz, 55.04, eighth. Chhang placed seventh in the high hurdles in 17.87 and Alex Ramirez eighth in 18.72. In a highly competitive high jump, two Leopards cleared six feet. Daily Nickerson was fourth with 6-0 and Davin Burgess fifth, his first time over 6-0. Mack Carver cleared 12-6 for fourth in the pole vault. Chase Pearce was sixth with 11-6 and Jorge Vega seventh with 10-0. Giovanny Felipe was sixth in the discus with 114-6. Mendoza was seventh in the shot put with 43-9. In the relays, the Leopards took a first, a fourth and a seventh. The 4X800 was first in 8:31.92 with legs by Lerma, Villeda, Angeles and Hernandez. The Leopards were fourth in the 4X400 where Miguel Diaz, Villeda, Lerma and Hernandez clocked 3:35.38. The 4X100 unit of Chhang, Fernando Ferretiz, Nickerson and Jose Hernandez ran 48.1 for seventh. On the girls side Broken Bow tallied 153 points, Genoa Central 115, De Queen 111.5, Prescott 99.5, Idabel 61, Ashdown 42, Hope 26 and Nashville 24. De Queen’s scoring started with Kennedy Winship winning the discus with a throw of 108-6. On the track Josie Burke clocked 16.42 to win the high hurdles. Heidy Galvan won the 1600 meters in 6:01.61. Ashlyn Chambers ran 2:40.25 for second in the 800. Maddie Martin ran a PR of 50.03 for second in the intermediates. Pamela Delgado was third in the 3200 meters with 14:08.01. Xoctil Flores finished fifth in the 1600 in 6:20.54 and Delgado sixth in 6:26.53. Flores ran 2:52.96 for sixth in the 800. Burke, 55.29, was seventh in the intermediates and Martin, 18.45, seventh in the highs. Tatyana Tramble leapt 30-2 for second in the triple jump. Martin cleared 4-4 for fifth in the high jump. Burke finished sixth in the triple jump with 28-2.5. Halley Gentry cleared 7-0 to place fourth in the pole vault. Halle Harp was fifth at 6-6. Tramble finished fifth in the long jump with 13-8.5. The Lady Leopards were fourth in the 4X400 relay with Martin, Chambers, Burke and Dykes running 4:34.51. Haley Manasco, Anna Stinnett, Chastity Franco and Stacey Higgins ran 58.36 to place sixth in the 4X100.